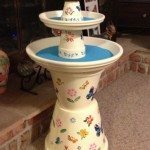 Turn clay flower pots into a brilliant bird bath | DIY projects for everyone! Is there any garden decor idea where clay pots can’t come in handy? Here’s another easy garden project with clay pots that not only you, but birds will love as well! Flower pots are one of the most common items to decorate a garden with as they are easy to work with. To get you inspired, we’ve collected 15 artistic and creative examples of a DIY clay pot bird bath below. Take note of the different ways the pots were put together! Do you know someone who will love to do this idea? Not crazy about the colors, but like the idea.